The ultra compact XA10 professional camcorder is designed for situations where mobility is critical while shooting. 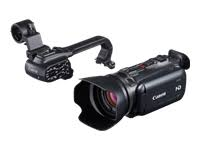 This feature-rich, professional model records Full HD 1080p using an AVCHD codec. The ultimate professional camcorder for run-and-gun shooting, the compact XA10 includes a detachable handle for low-angle shooting and portability. With the handle attached the XA10's functionality is further enhanced with the addition of XLR inputs and an external microphone holder. A genuine Canon 10x HD video lens delivers a wide, flexible zoom range and smooth, pleasing backgrounds thanks to an 8-blade iris. And an infrared mode allows users to capture video in conditions with little or no ambient light, a situation which would make other camcorders useless. Class 4 or higher SDHC or SDXC card required for 24Mbps and 17Mbps modes.